Local photographer in New London. Photos in local restaurants, businesses, and L&M hospital. 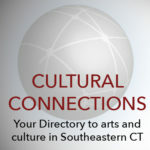 Exhibited in Garde Theater, the Stamford Museum of Nature and the Mystic Museum of Art. Also local events like the "First Woman's Fluke Tournament", and the decommissioning of the USS Dallas. I am a professional visual artist who is a painter,drawer and printmaker. My work is large, colorful, gestural and addresses issues of identity in contemporary life. I exhibit at Harmon Gallery, Jessie Edwards Gallery, and Coastal Contemporary in Newport, RI. I teach art at ECSU. I'm an artist. I create paintings using oil paint and cold wax. I accept commissions and am happy to meet with people of interest. I've worked as large as 48" square. I work on paper or boards. I work in watercolor, pen and ink, print making and mixed media. With my subjects I work to balance capturing external likeness and inner character, and as a veterinary student I am passionate about working with animals, which are a prominent part of my art. I am an artist in SECT that provides commissioned artwork and fine art photography. I also sell personal artwork and do portraits and event photography. I also offer art lessons to both youth and adults alike. Jean Henderson's main artistic goal, to be a role model for other mental health clients (she has bipolar disorder) and their families, is because NO ONE told her she could get better! She still must manage stress levels, but look at the work she makes! Artist, Painter in Oils, Watercolor, Pastel, including Landscape, Seascape, Still Life and more. 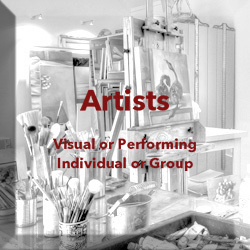 Classes and Workshops are available as well as private instruction and collaboration. National Plein Air Events. My Studio/Gallery in Chester also includes several local Fine Artist's work. Kathleen is a painter, mixed-media artist and printmaker focusing on monotypes: imaginative landscapes, energetic abstractions and geometric compositions incorporating rich textures and vibrant colors. She strives for compelling images that resonate with viewers on a personal level. Please visit website. Realistic painting of landscapes, seascapes, people and architecture. Lisa D’Amico's paintings focus on human emotions through her fascination with color and composition and the struggles that occur between them. Lisa is an accomplished art educator and curator. She shares her artistic passion and knowledge with children and adults. Textile/ Surface Designer. Recognized Artist Educator specializing in Educational Programs with the end goal to create a piece of art relating to curriculum, culture, business ,or community. Lectures, demonstrations, fund raisers, individual and group assessments.